Abstract Expressionist Painter: Landscapes, Seascapes: Biography, Paintings, Exhibitions. Born in New York, to Irish parents, Monahan grew up in Blackrock, Dublin. Although keenly interested in art, she first took a degree at the College of Marketing and Design before moving to London for 10 years to work and study graphic design as well as printmaking. She returned to Dublin in 1997. Since then she has managed to use her interesting set of creative skills (in interior design, graphic/book design and fine art) not only to help build the family house, but also to establish herself as a freelance designer and practice as a part-time painter. Which also explains how her compositions - quite apart from being real visual treats - are so perfectly suited for design applications. She has a perfect eye for a sympathetic palette and a natural flair for harmony of colour and texture. As a painter, Monahan has been influenced by expressionist artists as diverse as Camille Souter, Jack B Yeats and Pablo Picasso, and by both the layering and abstract structures of Cubism. 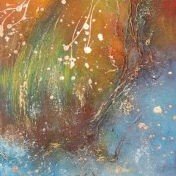 Inspired by the Wicklow landscape and the coastal seascapes of Dalkey and Dun Laoghaire, she works mainly in acrylics, which she uses to create interesting layers and depth to the canvas. Unusually, she never includes black in her palette, which allows her to produce lighter, brighter canvases. 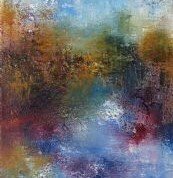 Invariably she begins by focusing on a landscape or an interesting piece of nature, and then sees where it leads ("my work is an emotional response to landscape" she says), relying on multi-layers of paint and different textures to produce the desired effect of mood and emotion. Over the past three years, she has shown her works in numerous venues, including: Dun Laoghaire Rathdown Annual Winter Fair (2005, 2006, 2007), Expose Yourself Gallery Dun Laoghaire (Nov-Dec 2007), Beaufield Mews Gallery Stillorgan (2008), and the Baby Elephant Gallery Dun Laoghaire (2008). She will be exhibiting later this year at the Norah Dunne Gallery Terenure, the Dalkey Heritage Centre, and at Art Ireland in the RDS (Nov 2008). In addition, she is a member of IrishArtHouse, an online gallery showcasing panel-selected emerging artists. Already, Monahan's works hang in private collections in Dublin, Britain, Luxembourg, and the USA. Painting to please yourself, is one thing. Painting for customers, is quite another, and I think Monahan does it exceptionally well. She herself says: "My work is very affordable, and doesnt just provide a focus point on the wall, it brings it to life!" Amen to that. To contact Barbara Monahan, or to see more examples of her work, visit her website: cocoondesign.wordpress.com/ or www.irisharthouse.ie.